Summary: According to researchers, a hand held device that records electrical activity from the retina may be a useful tool in diagnosis schizophrenia. Docia Demmin (left) and Steven Silverstein demonstrate how the hand-held device RETeval may prove to be a more accessible way to diagnose schizophrenia, predict relapse and symptom severity, and assess treatment effectiveness. NeuroscienceNews.com image is credited to Nick Romanenko / Rutgers University. Image Source: NeuroscienceNews.com image is credited to Nick Romanenko / Rutgers University. Original Research: Abstract for “Electroretinographic anomalies in schizophrenia” by Demmin, Docia L.; Davis, Quentin; Roché, Matthew; and Silverstein, Steven M. in Journal of Abnormal Psychology. Published May 2018. Rutgers University “Eye Function May Be Key to Schizophrenia Diagnosis.” NeuroscienceNews. NeuroscienceNews, 30 May 2018. 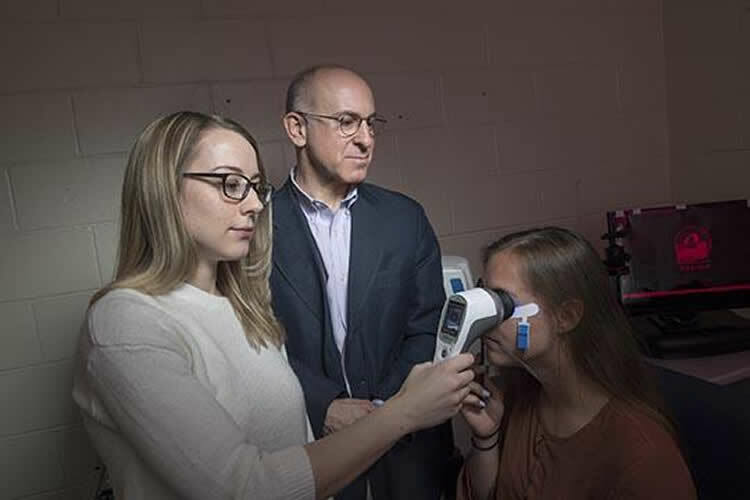 Rutgers University “Eye Function May Be Key to Schizophrenia Diagnosis.” http://neurosciencenews.com/eye-function-schizophrenia-9180/ (accessed May 30, 2018). Flash electroretinography (fERG) has been used to identify anomalies in retinal cell function in schizophrenia. Several consistent findings have now emerged, but several potentially important parameters have not yet been investigated. In this study, we recorded light- (photopic) and dark-adapted (scotopic) fERG data from 25 schizophrenia patients and 25 healthy control subjects to (1) determine if past key findings on abnormal photoreceptor and bipolar cell signaling could be replicated; (2) for the first time, examine retinal ganglion cell functioning using the photopic negative response of the fERG; (3) also for the first time, determine responsiveness of schizophrenia patients to a flickering stimulus, as an additional method to isolate cone photoreceptor function; and (4) determine if schizophrenia-related changes in the fERG could be detected using a portable hand-held ERG device. In both photopic and scotopic conditions, schizophrenia patients demonstrated weakened photoreceptor and bipolar cell activations that were most pronounced in response to the most intense stimuli. A reduced cone response to a flicker stimulus and attenuation in ganglion cell activity were also observed in the schizophrenia group. In general, groups did not differ in implicit time of retinal cell responses. These findings (1) replicate and extend prior studies demonstrating reduced photoreceptor (both rod and cone) and bipolar cell functioning in schizophrenia; (2) indicate that retinal ganglion function abnormality can also be detected using fERG; and (3) indicate that these anomalies can be detected using a portable testing device, thereby opening up possibilities for more routine administration of ERG testing.